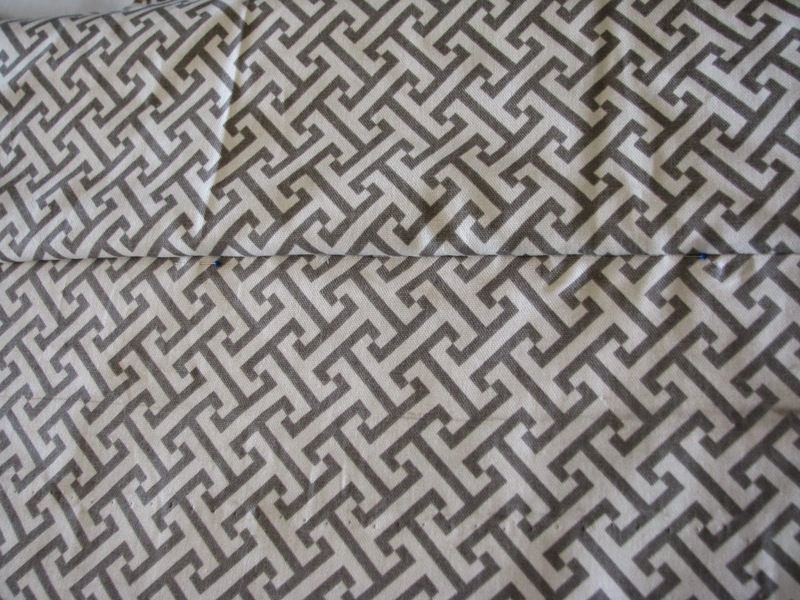 As part of my Bonus Room makeover, I wanted some roman shades with a geometric print. 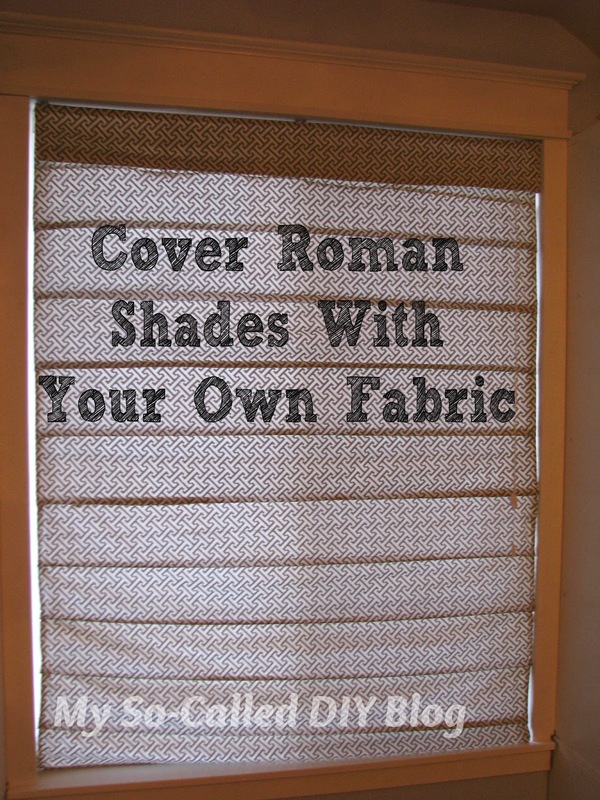 I figured my best option would be to cover a cheap roman shade with fabric. I found the perfect fabric from Joanns. 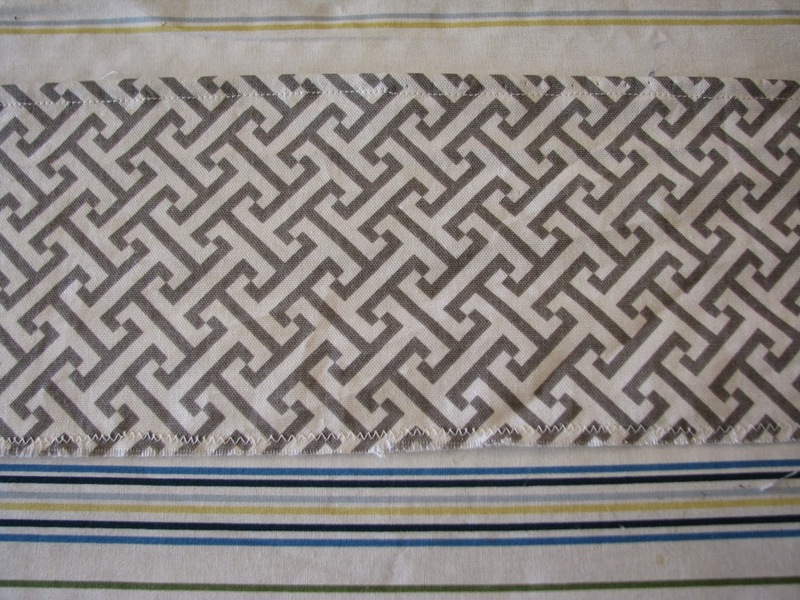 I found a reasonably priced white roman shade on JCPenney.com. They often have good home sales and coupons. I've covered one of these shades before with black out material for my master bedroom. 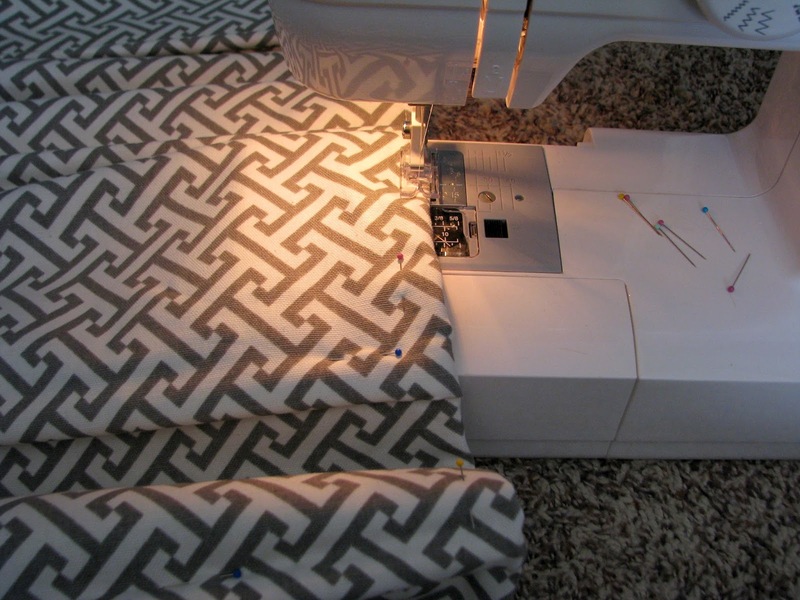 I just followed the lines and used my sewing machine, but it was hard to handle the large size and keep everything straight on the machine, especially around the dowels. 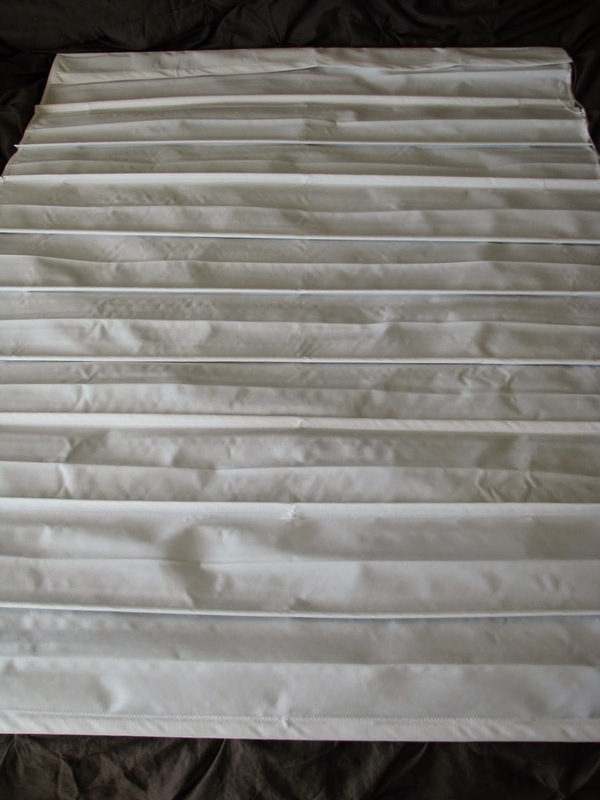 I decided to use some Stitch Witchery on the dowel folds this time. 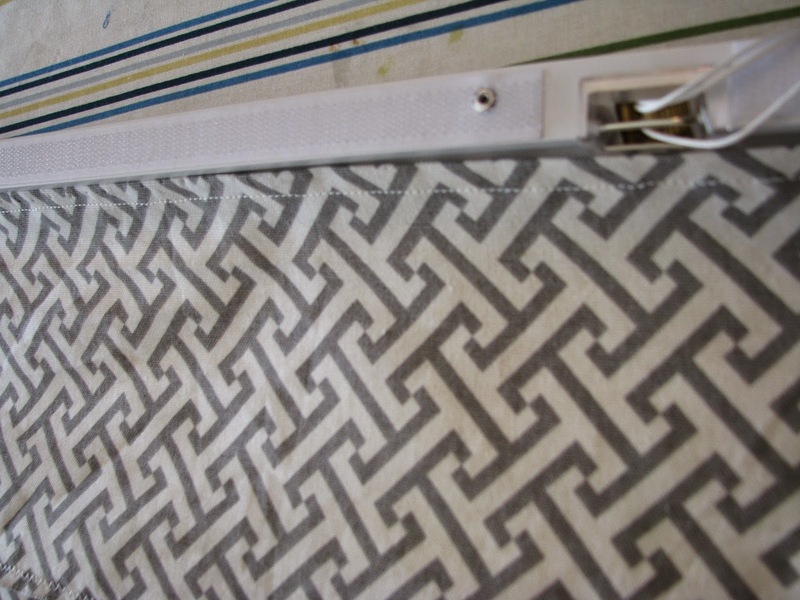 First, I laid out my Roman Shade and removed the top piece that's attached with velcro. 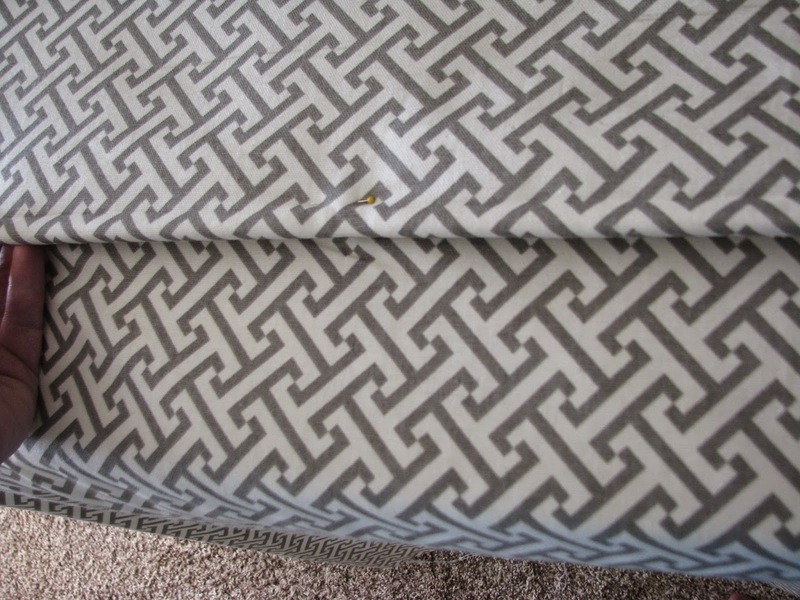 Then I laid my fabric on top of the shade. 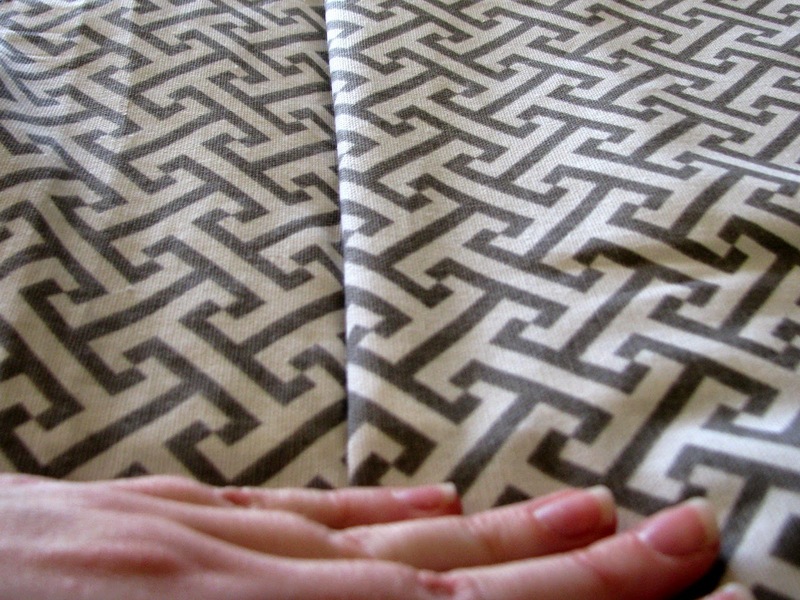 I hemmed the top, but since it will be covered by the top piece at the end, you could just zig zag it or leave the edges raw. 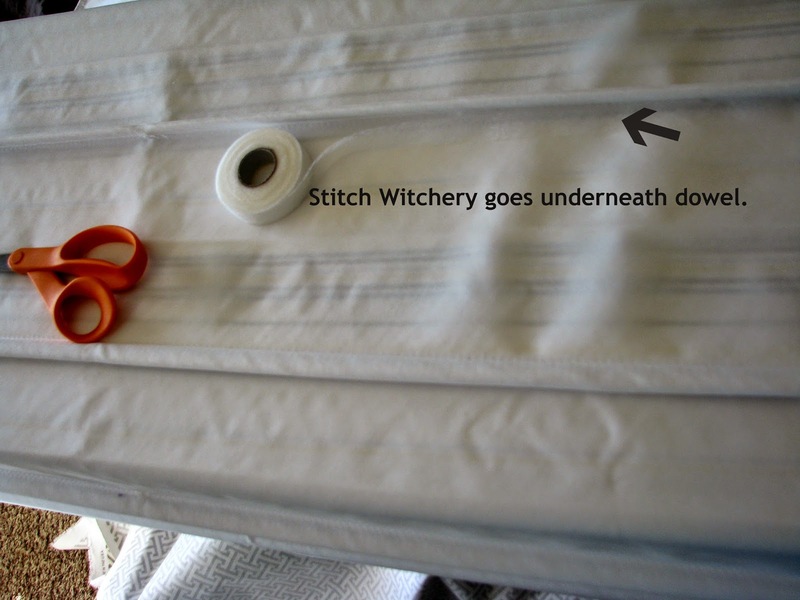 Next, I rolled out my Stitch Witchery and placed it under the hem. Following the directions on the Stitch Witchery, I placed a damp cloth on top and pressed my iron on it for at least 10 seconds in short sections all the way across. Then I turned it over and did the same on the back. 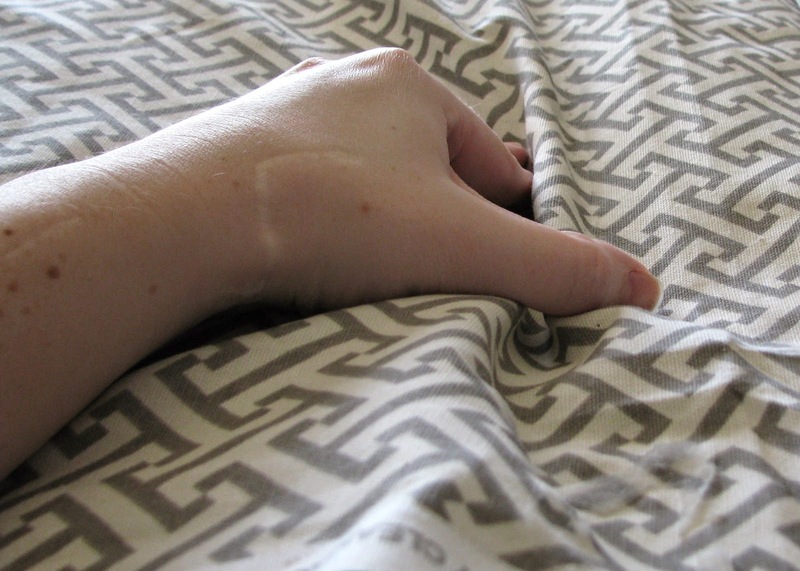 I smoothed out the fabric so it was taut, pinched the fabric around the dowel, and smoothed it down. To help hold the Stitch Witchery in place, I pinned the fabric and Stitch Witchery to where it needed to be under the dowel. 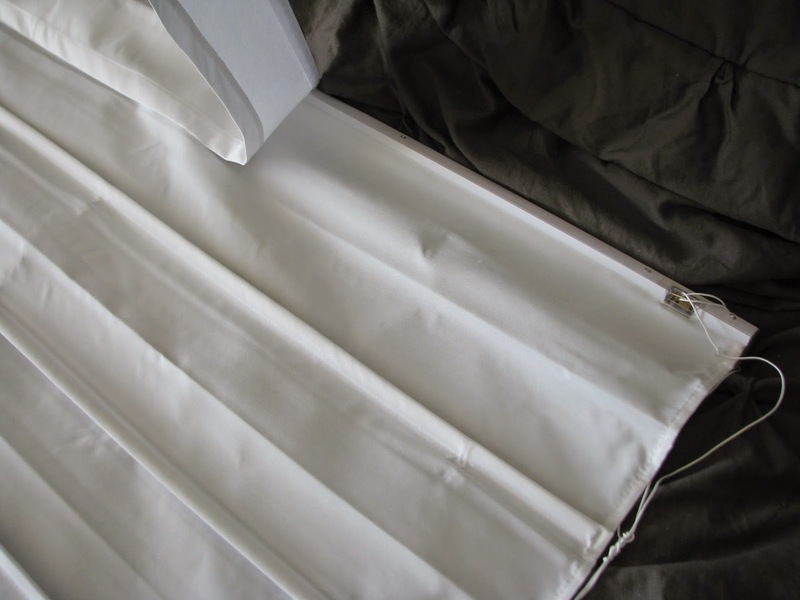 Once it was pressed on both sides, I pinned the top fold to help hold the crease in place until the sides of the shade were hemmed. Then I repeated for each dowel all the was down to the bottom. 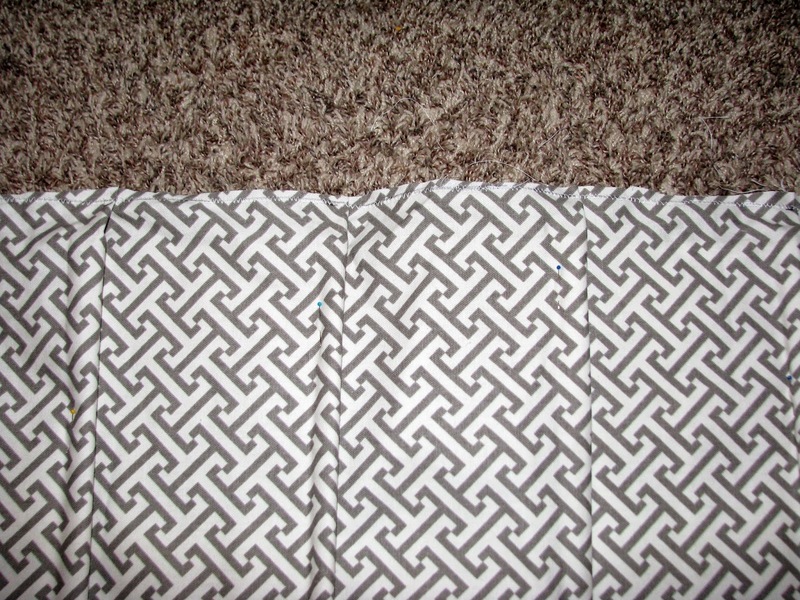 On the bottom, I wrapped the end of the fabric underneath the shade and just used my sewing machine to stitch it to the shade. 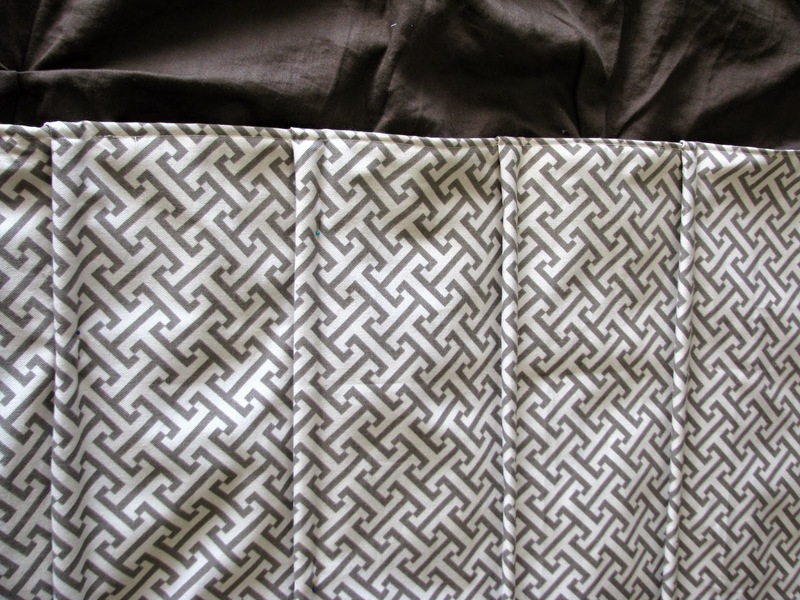 You could easily use more Stitch Witchery, but it was simple enough for me to sew the bottom and it gave it a little more stability. Next, I needed to sew the sides. Again, you could probably use Stitch Witchery, but I felt the sewing machine would give it a more permanent hold. On each side I measured one inch from the outside of the shade and drew and line to zig zag on. Then I folded fabric under the sides and pinned it in place. 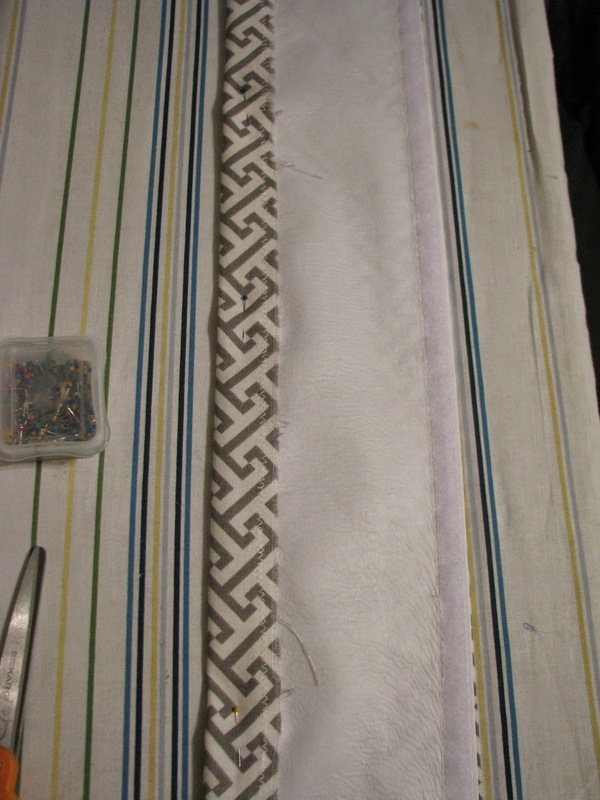 I sewed along the sides, making sure the dowel folded down. 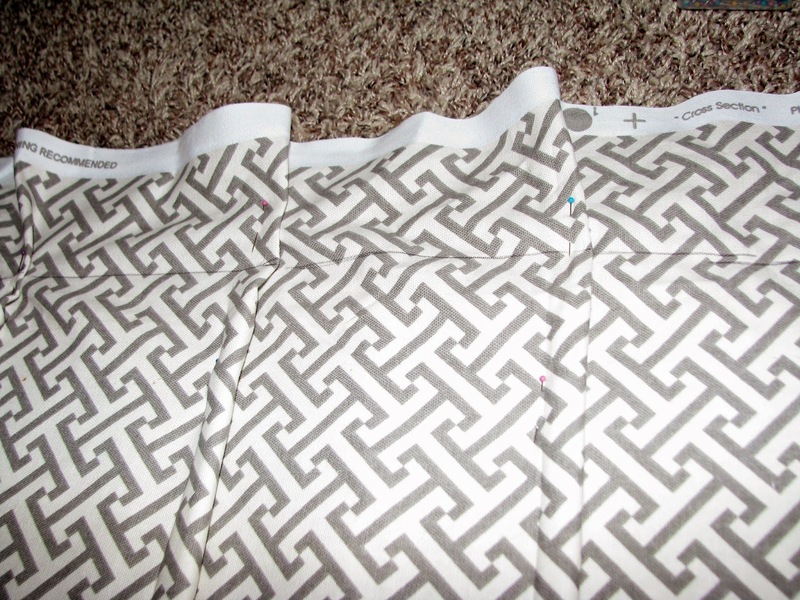 Lastly, I covered the top piece with the little bit of fabric that was left. I didn't want to hem the top over the top of the piece because there was the velcro on the back, so I just hemmed it and used Stitch Witchery to attach it to the top. 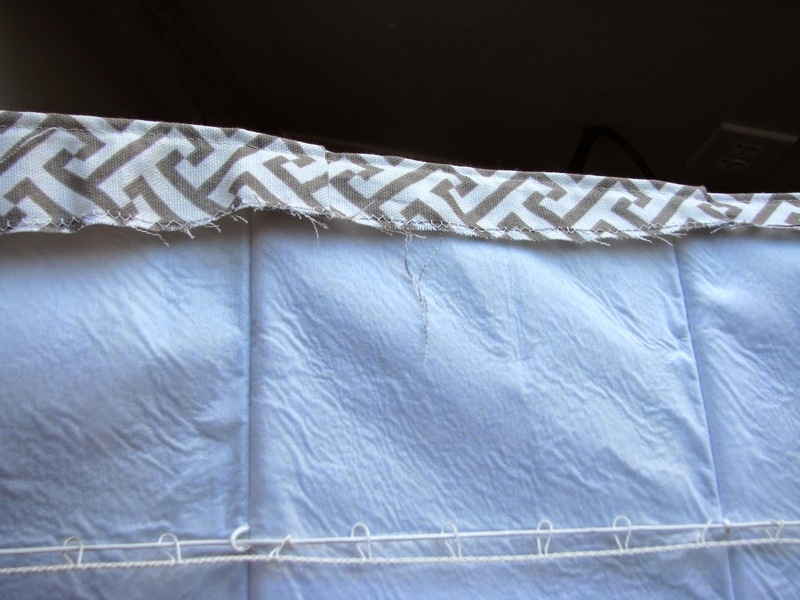 Then I hemmed the sides and bottom with the sewing machine. Then I put the top piece back on and used the hardware the shade came with the put it in the window.